161-163 North Street was built c. 1875. It is the second building on the left in the below photo, taken c. 1930. Civil War veteran Peter Lander, Jr., bought the house in 1880 and lived there until his death in 1937 at the age of 89. His children continued to live in the house until 1961, during which time it was converted to a duplex. 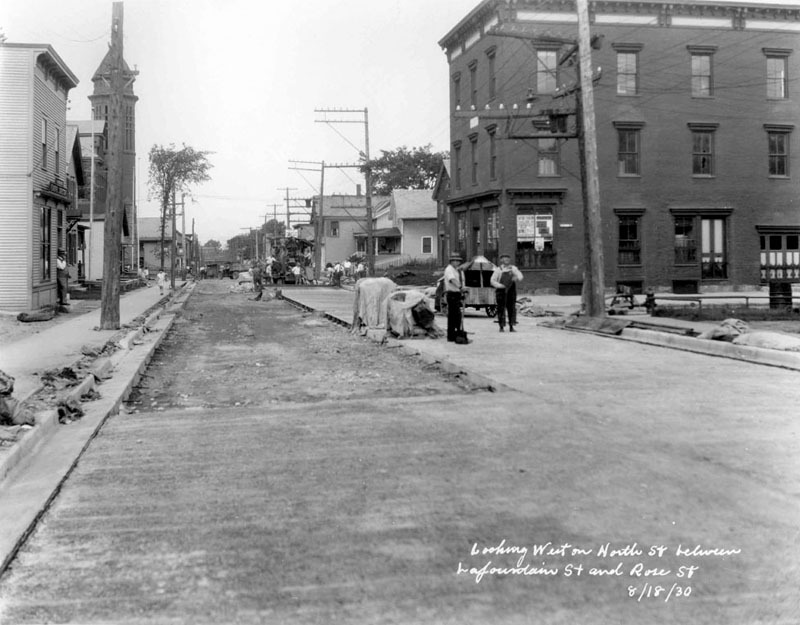 Burlington as we know it today is but the latest incarnation of a richly storied city. The Old North End neighborhood lies at its heart, ripe with the character of generations. Since the Civil War, the North Street area has been known for its strong community, ethnic diversity, and commitment to self-determination. A hundred years ago, more than half its inhabitants hailed from European immigrant families, poised to build independence in a new country. Nowadays, in the tradition of Burlington’s oldest miniature melting pot, the North Street area sees an influx of Asian and African emigres. This diversity of contributions to Burlington’s community and economy has contributed to the city’s entrepreneurial reputation. Historically, many of North Street’s most prominent businesses – Frank’s Economy Store, Mazel’s Department Store – have been locally owned and operated. Though the Great Depression closed many doors, the Old North End continues in the spirit of old, catering to local needs and offering the once-disenfranchised a second chance. Kelly Kaeding’s acupuncture clinic at 161 North Street continues to exemplify these classic values. Kelly and her husband, Mark Davidson, renovated the previously residential property before installing her practice, an undertaking that earned them Preservation Burlington’s 2013 Historic Preservation award. She hasn’t forgotten the building’s oft-dramatic history, though. Peter Lander, a.k.a. Pierre Therrien, the longest lived of Burlington’s Civil War soldiers, spent most of his life in the house. He died there on April 30, 1937, a couple months after his sleeve caught fire while he made a cup of coffee one night. He and his family lived in the house for over 75 years.